Man has used dogs to help him hunt for centuries and different types of hounds have evolved to deal with the various prey. Larger, heavier hounds would have been needed to deal with wolves and wild boar, but in areas where small deer, rabbits or hare were hunted, the speedier, more agile Greyhound type of dog would have been more suitable. The more enclosed area meant that a smaller hound would have been preferred over the Greyhound. At the end of the eighteenth century, the medium-sized running dog appears to have acquired a name of its own - the ‘whippet’ or ‘snap dog’ - and was a popular breed among the working men in the north of the country. These dogs were used for rabbit hunting and later for racing. Whippets became known as ‘the poor man’s Greyhound’ and were highly prized possessions, living curled up by the fire and, it is said, often fed better than members of the family. They were expected to earn their keep at race meetings where betting took place, so a dog that lacked speed would not be considered of any value. Only the best females would be bred from, and only the fastest dogs used at stud, so once more, the Greyhound type of animal predominated and the Whippet quickly reverted to type. Whippets live up to 14 years of age. 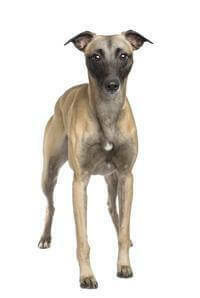 Whippets have an agreeable temperament and make an ideal family pet and a wonderful companion. It is often said that females generally make better pets than their male counterparts because they are more affectionate and obedient. However, this is quite the opposite for Whippets where the male is the more obedient, friendly and outgoing of the species. The vast majority of Whippets are not aggressive towards other dogs. Similar to most animals blessed with great speed, they prefer to use their speed to get out of a fight. Whippets are much tougher than they look and will happily go for a walk in weather that would deter most owners. Being high on the leg, they bring in relatively little dirt after an energetic walk, and their short coats require only a minimum of grooming to keep in trim. Whippets have been described as the lazy man’s dog, because they are easy to look after and to feed. They do need daily exercise, and similar to most dogs thirty minutes walk daily on a lead will keep them healthy and reasonably fit - they will also appreciate fifteen minutes free running where they can really ‘stretch out’. Although in many breeds it is considered that females make better house pets than dogs, this is not necessarily the case with Whippets.